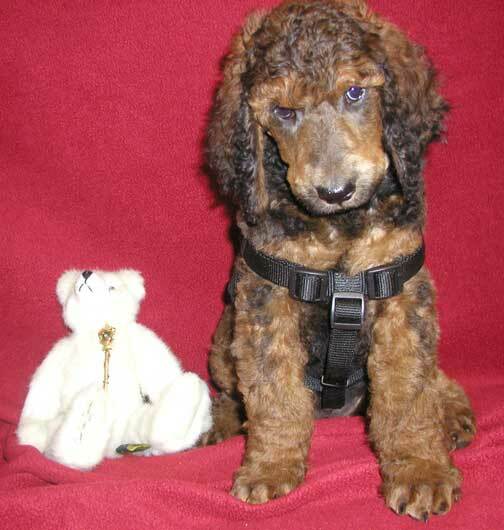 Color Clarification Coat Differences - My Standard Poodle Puppies For Sale include Red/Apricot, Black, Brown, and Phantom/Agouti. 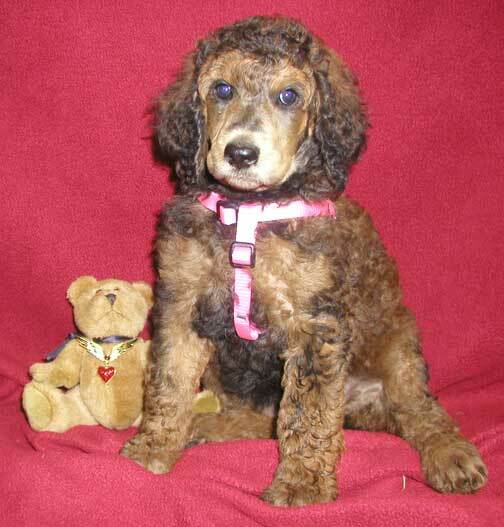 MOST offspring range in size from Large to Giant and are always an AKC Standard Poodle. Clarification: A Solid Colorpuppy will be one color on the body. They may/may not have white hairs on paws as you see in the picture. Solid Colored bodies will be brown, black/blue, or apricot/cream with no white abstracts on their chest. 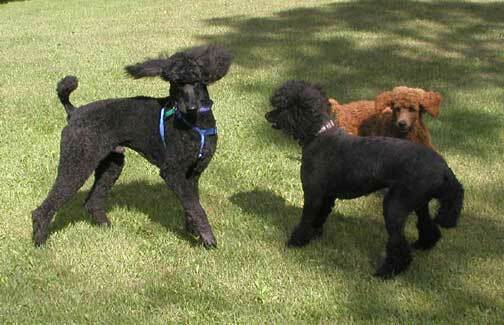 Sure, they may have white hairs under paw pads, they are still considered solid colored poodles. This coloring is called a Phantom, markings of a Doberman or Shepherd. This is a recessive gene from wolves first existence in developing into the canines we have today. 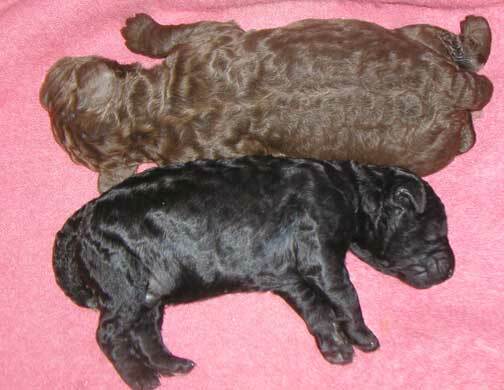 We have black with apricot markings, brown/apricot, and brown black blend with apricot markings that have been born. Clarification: in all the below colors, I cannot guarantee any one pup color can be correctly defined for the customer that it will Gray, Lighten, or Hold its color...it MAY CERTAINLY Gray, Lighten, OR HOLD its color. I just CAN NEVER guarantee which puppy will be any one of these...please, it would be wonderful to know if ANY breeder could positively identify a Holding color, without a doubt, guarantee a customer they would be getting with certainty a Holding color. It may be a breeders continuous research to attain this - YES, but the centuries of mismatches have possibly caused an extinction of such...it is #1 HEALTH, #2 Size, #3 structure (as spay/neutering ALWAYS shifts their body structure when done under one yr of age), then personality. These are what I personally breed toward in my program. Holding Red (red to red mating), darker red/apricots may be born, otherwise apricot and creams may be born to some of red Daniel's matings, WHICH MOST have held their red or apricot color. As my focus is on ROYAL and HEALTH, there is never a guarantee a red color holding, yet we believe MOST do from feedback. 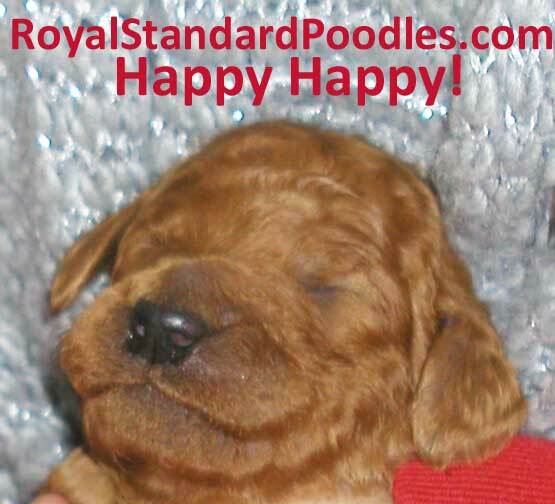 It is in matings to grow the size to Royal that I will be able to provide some Royal red/Apricot/creams for lookers - WITH HEALTH & temperament in mind! Black/Blue - "Slash = /" means "or" here, Black "or" Blue. I am not professional enough to differentiate between these two colors at such a young age and have erroneously stated this one would be a Black where the pup turned out to be Blue disappointing the customer. I do not want to disappoint anyone and state here that on the form the pull down list shares Black/Blue which means you may get one or the other but I cannot be sure which it will be once full grown. Sorry, your agreement in choosing this color needs your understanding and agreement. 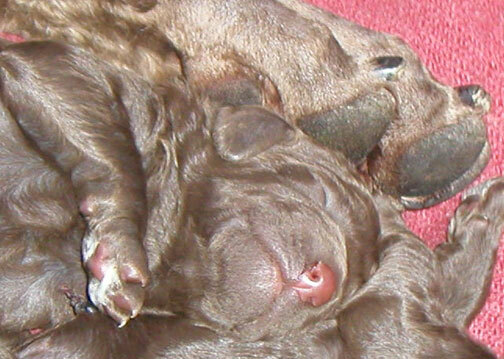 Browns - some lighten, some get gray hairs growing in, yet you still recognize brown as being brown. Some browns will not gray or lighten, Tes has talked about "chocolate" vs "dark chocolate". 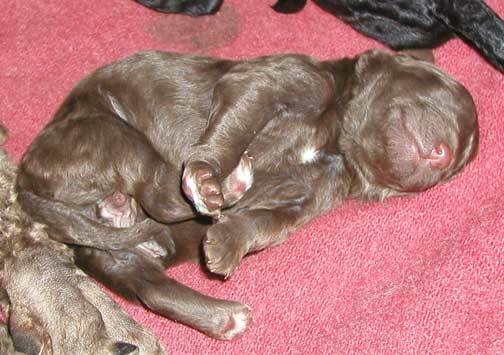 There is no way for us to tell if a puppy will gray, lighten, or keep its color. Here are some customers that have browns that have kept their color or "lightened" > Carlo, Brody, Duke, and Briggs. Here are some customers that have "grayed" > Juno, Fergie, and, Bear. Sorry, your agreement in choosing a brown needs your understanding and agreement of this. Apricot/Cream - "Slash = /" means "or" here, Apricot "or" Cream. I am not a DNA gene color Mother Nature professional to know if the Apricot is going to stay apricot or fade to Cream and do not want to disappoint the customer. I do not want to disappoint anyone and state here that on the form the pull down list shares Apricot/Cream which means you may get an Apriot or Cream with possibly the Apricot fading out. Sorry, in choosing this color your understanding and agreement is needed. 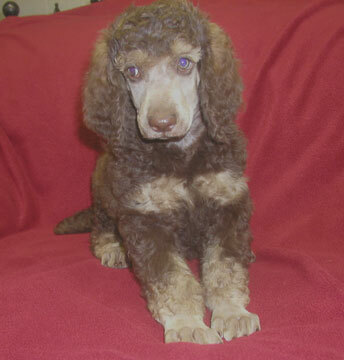 My research in viewing their coat texture over the years of breeding the brown/chocolate large standard poodles...the differences can be found in the Red/Apricot/Creams as well as the Black/Blue.